Indications emerged yesterday that both the ruling All Progressives Congress (APC) and the main opposition party, Peoples Democratic Party (PDP) have resolved to approach the planned impeachment of the Senate President, Bukola Saraki, as a battle of supremacy in the Senate by which both parties wish to fiercely assert its dominance over the other. According to findings by Peoples Daily, the Senate President is largely banking on the moral and political support being given to him by the opposition PDP to survive his travail, while the ruling APC is leaving no stone unturned to cajole more PDP senators to enable the party effect a seamless impeachment of Saraki. Information revealed that the chairman of APC, Adams Oshiomhole, has been lobbying some PDP senators with a view to get the required two/third majority to impeach Saraki. A source revealed that the meeting yesterday between the APC chairman and APC National Assembly caucus was to put finishing touches to the impeachment plot. However, the PDP, our correspondents gathered, has resolved to ensure that Saraki and his deputy, Ike Ekwerenmadu, are adequately protected from impeachment, hence the party has given a directive to its members in the Senate to ensure that both party leaders are protected by every available means. Peoples Daily reports that the opposition party has impressed on its members the need to remain loyal to the party by taking the Saraki defence as a party agenda, which must not be traded off at any cost or for whatever reason. To this end, the APC, which has perceived the PDP as being desperate, yesterday accused the PDP of planning to attack some of APC Senators and create violence in their desperate bid to ensure that Saraki clings to the position of Senate President. But the PDP swiftly denied the charges yesterday saying they were not true but mere childish allegation bereft of fact. The party in a statement issued yesterday by the acting National publicity Secretary, Yekini Nabena, called on security agents to protect APC Senators, saying If any Senator is harmed, the PDP and Saraki should be held directly responsible. “We call on security agencies to also closely monitor the activities of some PDP leaders including Saraki because the plan to attack APC Senators is real and imminent. “We were informed that the plot was hatched in the private residence of a PDP leader in Maitama-Abuja on Sunday night. The meeting was attended by 15 pro-Saraki Senators including the Senate President himself. 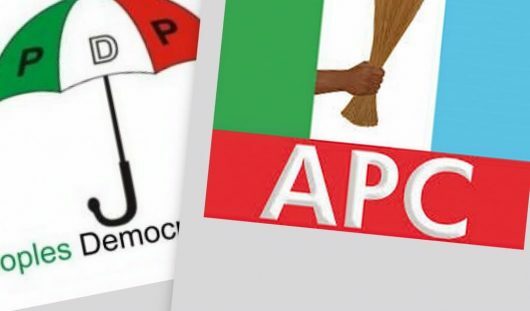 “We learnt that the PDP expressed worry over the APC’s Senate majority and considered several options to stop the APC from taking over the Senate leadership among which is attacking some APC Senators to ensure their inability to attend legislative sittings”, the APC said in the statement. The APC accused the opposition PDP of recruiting thugs for this purpose, saying “we have now learnt that during Sunday’s meeting, the PDP Senators planned several types of attack, one of which is to lure some of them (APC Senators) out at night in the guise of inviting Senators to a political settlement meeting and thereafter instigate a violent confrontation during the meeting and unleash standby PDP thugs on APC Senators, our source privy to the meeting informed us. “This revelation has not come to us as a surprise because the Senate President through proxies has made several failed attempts to buy over APC Senators with N100million each. “As a Party, we do not believe in inducing lawmakers to achieve our legitimate goal of removing Saraki as Senate President. We will get the support of some PDP Senators to get the required 2/3 vote and impeach Saraki. We are already talking to some of PDP Senators who believe and support the direction of the President Muhammadu Buhari administration to achieve our legitimate goal. “We reiterate our call for Saraki’s immediate resignation as Senate President. He cannot lead the APC majority Senate. But if he fails to resign honourably, we will impeach him. The PDP’s propaganda and threat of violence cannot save him”, the statement said. The party also blasted Saraki for his decision not to reconvene the National Assembly, saying he is putting his selfish interests over national interest. “Saraki’s decision with the support of the Speaker, House of Representatives, Yakubu Dogara, further buttresses our position that Saraki is ever ready to pursue his selfish interests over national interest. This is another brazen display of his penchant for abuse of powers and sabotage of government, irrespective of the cost and implication. “While Saraki and his cohorts continue to postpone their doomsday regarding the imminent Senate leadership change, the yet-to-be considered 2019 budget of the Independent National Electoral Commission (INEC) is dangerously delayed. Clearly, Saraki’s actions as Senate President now bother on high treason”, it concluded. However, in its response, the Peoples Democratic Party (PDP) described APC fears as fabrications, saying allegations that PDP plans to attack APC senators is laughable and childish. The party said that the claim shows that Presidency and the ruling party have come to a wits end in their plot to illegally impeach Senate President Bukola Saraki and Deputy Senate President Ike Ekweremadu. In a statement issued by its National Publicity Secretary, Kola Ologbondiyan, in Abuja, PDP said that the ruling APC is hallucinating by linking it with any attempt to attack anybody, including senators, whereas Nigerians are aware that if anything, it is the APC that has been involved in sponsoring violence and attacks in the residences of the presiding officers of the Senate, as well as in the National Assembly. “Equally derisory is the APC’s claims that it is in talks with some PDP senators to get a two third vote to impeach the Senate presiding officers when it is public knowledge that all PDP senators are loyal to their party and had already pledged their loyalty to the presiding officer which they elected by themselves. “It is therefore foolhardiness for the leadership of the APC, to contemplate a capacity to impeach the presiding officers of the National Assembly whereas they are neither senators and members of the House of Representatives. “It is also funny that rather than lobby senators and members on their party position, if they have any, the APC leadership toed the path of brigandage, claiming to have powers to upturn or upstage the leadership that it did not ab-initio bring into existence. “Confronted by the realities of its shameful adventure, the APC leadership has now turned around in its trademark shambolic character to begin to look for scapegoats and who to hold responsible for their failures. “It is necessary to impress it on the APC that Nigerians, in attracting a democratic lifestyle, have since abandoned the garrison command leadership approach of any Nigerian, no matter how highly placed. “Therefore, it is too late in the day for the APC to attempt to deploy underhand tactics that are strange to democratic norms to remove a duly elected Senate leadership”, it said.